It's cool that we live in a postmodern world where a person far removed from the streets of Seoul can announce "I like Boba Juice" without sounding like they've recently received a head injury. Bubble Tea, Boba Juice, or whatever you want to call it (and I would probably bet money that a decade down the line there'll be a "craft"-esque pissfight over which descriptor is Right and True to use) is a thing that even colliery-terrace Mole Men like your correspondent know about. It's getting to be everywhere. 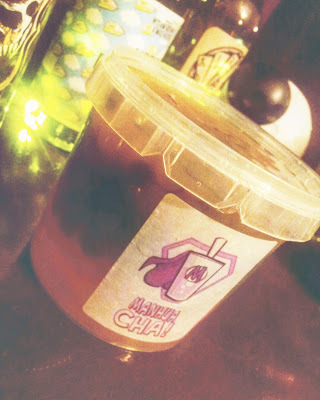 Manhua Cha is a startup company here in the North East, and they sling Bubble Tea by the barrel-load. Emma and I keep running into them at conventions and the idea struck both of us that it would be a good idea to put some of Manhua Cha's balls in my drink. I am so, so sorry for going blue on this one. 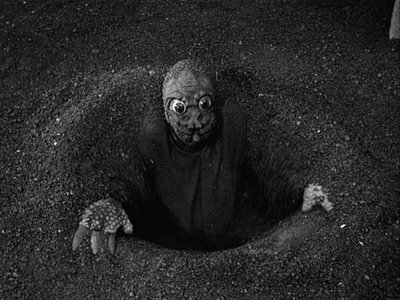 Forgive a Mole Man his indulgences. Bubble tea is a tea-like substance that is characterised by the Boba Balls (I like to think that Boba Balls is Boba Fett's cousin who became a urologist instead of a bounty hunter) that lurk flavourfully at the bottom of the cup. Manhua Cha Boba Balls come in strawberry, blueberry, mango, passionfruit and kiwi flavours, the last three conveniently being taste notes that have "juicy IPA" scribbled all over them. It was a pretty short flight of imagination to link this with the idea of maybe throwing them in some otherwise bland, cheap beer to see if anything cool happened. Original, Premium and indeed Refreshing (so claims the bottle artwork) Rapaz lager sells for £1.99 a three-pack at Home Bargains. Normally it tastes of despair that they've sold out of Citra again, with an aftertaste of "at least I'm not having to buy Skol". A citrusy and floral nose from the neck crumbles into pondy supermarket lager stank but it's still okayish and better than Skol. A quick scan with the Mouth, Human, Mark 1, confirms that the beer is indeed cold, wet, and has alcohol in it. Cracking open the tub of Boba Balls unleashes a gush of juicy, fruity flavour. Somewhere in the cold vastness of Psychologist Hell, Sigmund Freud reads that sentence and cracks his knuckles. Passion fruit balls are at the top of the pile, and I spoon a few out, tumbling them into the the glass. After ten minutes they don't change the taste of the beer because Boba Balls don't dissolve, and it's time to whip out the heavy calibre straw with which Bubble Tea is served, big enough to admit the balls up the pipe. Seriously if I keep up with this dangerous use of words like "ball" and "pipe" and "mother" Sigmund Freud is going to rise from the dead and go on a horny rampage in downtown Vienna. The passion fruit orbs burst in the drinker's mouth and almost, almost, overpower the beery mundanity of Rapaz. I underballed this one. Around two years ago supermarket giant ASDA took something precious away from me. One day I'll descend into supervillainy and the calling card I'll leave at the scene of my atrocities will be a twist-top bottle of the old, beloved, gone-too-soon 4.8% abv Biere De Luxe. Two reductions in its hardiness have rendered it dead to me, and my life shallow and grey. Thankfully ASDA rolled out its Champigneulles strong lager, a fine successor to BdL. It hits heavy at 5.5% and fills the gaps between Craft nicely. The city is safe, for now. 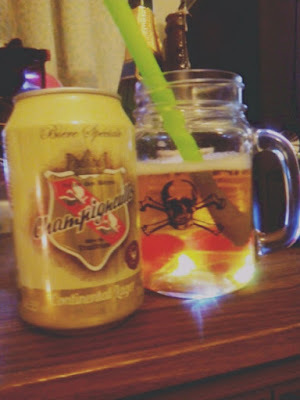 Champignuelles is a fatty-tasting, round and stickily malty supermarket lager. 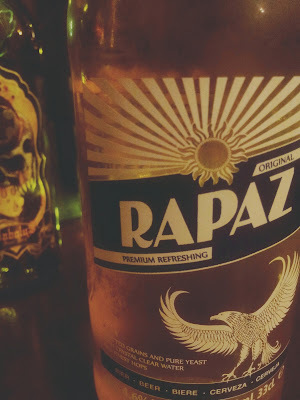 Not all beers are made equal and it outclasses Rapaz. Both, however, suffer from having far too many words on the label. 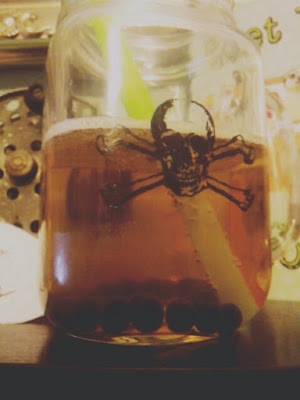 Putting a load of blueberry Boba in it and then hoovering up a couple of mouthfuls of bargain booze makes for a weird blueberry lager that you have to chew, which reads like Damning With Faint Praise but the blueberry does coexist with the lager, feeling almost like a proper taste note. I have three more cans of this stuff, but another beer and another flavour of fruity ball call to me. 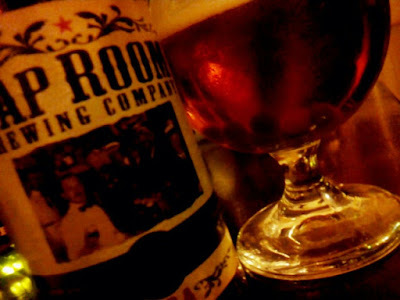 A few years ago I tasted Tap Room IPA from Sainsbury's, and I thought it was amazing. I think I drank it non-stop for several months because to me, then, it was majorly fruity. I bought a bottle a few months ago to reassess it and it flopped. It just tasted dull and blank to me. I chalked it up to my palate changing and just moved on from it, and so tonight I picked up a couple of bottles of it so I could adulterate it with little juicy planets. To my surprise, and to my chagrin as well because it kind of rips up the theme of "add sugary fruit goodness to otherwise dull beer". Tap Room IPA tastes fruity and spicy again. Maybe I had had a bad bottle. Nevertheless it's time to double down and tip in a load of kiwi fruit orbs in there. The kiwi fruit slides in perfectly neatly with the IPA taste profile. After all, kiwi is certainly on the list of fruity taste notes one can expect in an explosive and juicy IPA. It toughens and sweetens the beer. I'm glad I didn't publicly slam the hop infusion teabags that caused a brief social network rumble earlier this year, or maybe last year (I wasn't paying attention or really caring a lot) because this makes me think of a much more straightforward way to bangerise a not-juicy-enough IPA. Of course, you'd have to turn in your Craft Badge and Craft Gun for employing this renegade technique (but like all dirty Craft Detectives I have a spare Craft Revolver stashed under the bed that the dumb chief doesn't know about). 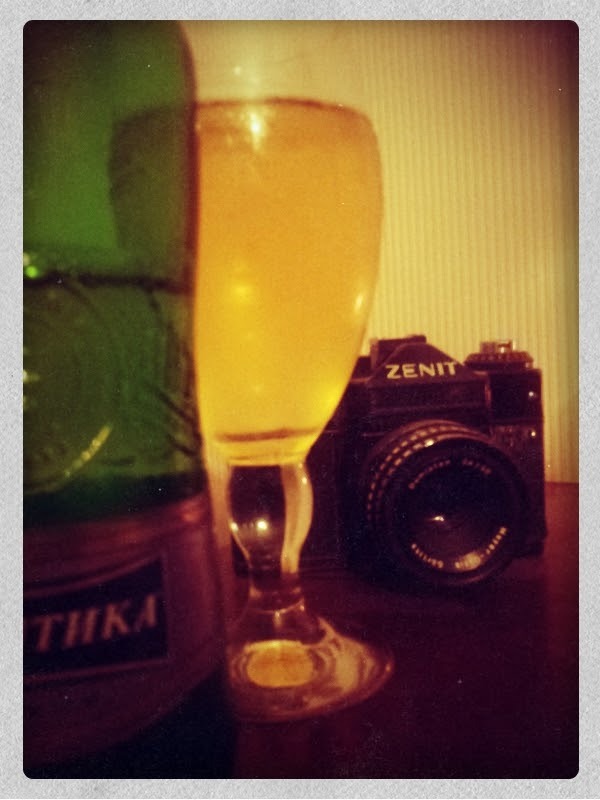 Baltika 7, which is easy just to think of as "Baltika" since its other numerically-named stablemates are rarely seen in this reporter's manor and, I assume, the rest of the UK, tastes of sweetness and not much else. To give this incredibly pale lager (and seriously, just look at the picture below. I've seen moodier glasses of prosecco) the benefit of the doubt, my palate is shot by this point. And by this point, the neatly regimented rows of Boba Balls, organised by flavour, are now all messed up. Discipline has failed. Things fall apart; the centre cannot hold, and the beer writer, who didn't really go into this with scientific method in mind, just slams a spoonful of assorted Bobas into the glass and gets the straw ready. On this incredibly blank canvas of pale nothingness the multitude of bursting and juicy Bobas really excel, adding spark and vim to a beer that, at this point in the night, tastes of very little at all. Strawberry, kiwi fruit, passionfruit, mango and blueberry burn their initials into Baltika's pale flesh and, after a few minutes of chasing with the straw, the experiment is over. Once again this reporter has put weird things in his glass so you don't have to. 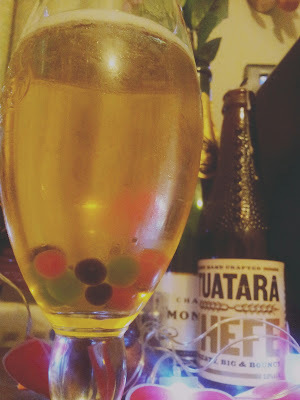 Juicy Boba Balls, in this case fruit-flavoured balls originally intended to compliment the fruity flavours of Manhua Cha's teas, worked to varying extents with cheap and largely unimpressive beers, adding a bit of whimsy and more than a bit of flavour to beers that were short on both counts. 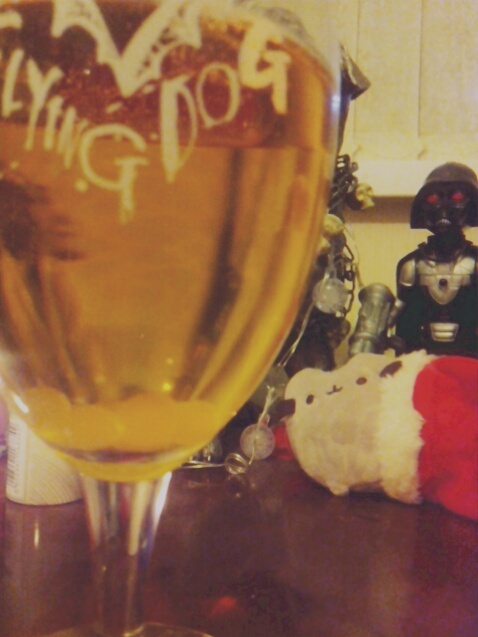 "Mango hard or mango home" adds the long-suffering woman who has watched me type and drink for the past three hours, as she pours mango Boba Balls into a glass of mango lager, upon hearing my moans about not being able to find a decent closing paragraph.